Coming to DVD and Blu-ray on August 31st. 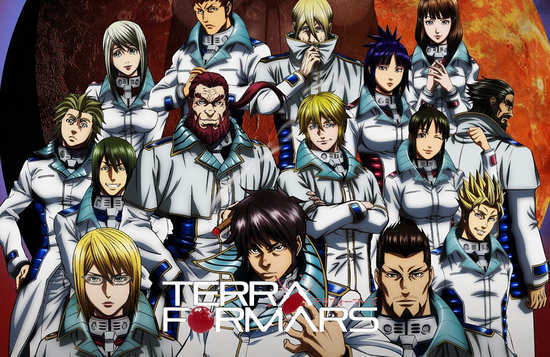 We are delighted to announce the release of Terra Formars Part 1 (of 2)! From the Co-Director and Key Animator of the hit series Steins;Gate comes this epic sci-fi adventure packed full of high-octane action and adrenaline fuelled storylines. A virus has spread around the world and humanity's only hope is placed in the crew of Annex #1, as they travel to Mars to inspect the effects of the Terra Forming project which begun thousands of years ago. The Project involved using moss, a plant that is very resilient and can grow in almost any environment, alongside a bug with equal qualities – Cockroaches. Their goal is to obtain samples of the resident cockroaches in the hope of finding a cure to the virus. Unfortunately those resilient insects have mutated into giant, aggressive humanoids with one overriding goal: exterminate the humans!